Th9 cells are recognized as a novel subset of effector T helper cells that preferentially produce IL-9. Here, we provide a current update on the reports related to the function of Th9 cells in allergic inflammatory diseases. The effector Th9 cells differentiating from naïve T helper cells have recently been identified. Because of accumulating findings of Th9 cells in many inflammatory diseases, including allergic diseases, diverse functions of Th9 cells in regulating immune responses have been suggested. 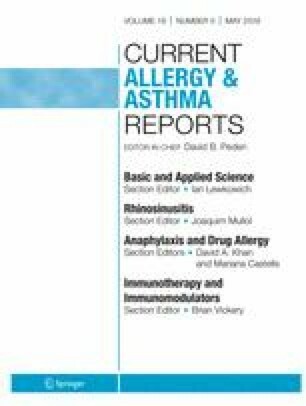 Related reports indicate multiple sources of IL-9 besides Th9 cells and their association with the pathogenesis of allergic rhinitis, asthma, atopic dermatitis, contact dermatitis, and food allergy. More recently, elements of the epigenetic landscape involving in the regulation of IL-9 by Th9 cells have been identified to be the potential target for allergic inflammation. This review provides the most recent information about Th9 cells and their contribution in airway allergic disease, skin, and food allergy.